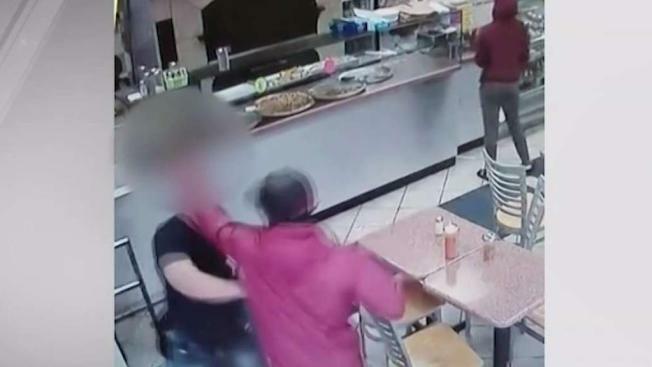 A man leaving a pizzeria in the Bronx was punched so hard in the face that his eye socket cracked and a vessel in his eye burst, and police say they are investigating it as a possible hate crime. Chris Bilcik, 60, was eating inside Ray's Pizza on East 138th Street in Mott Haven on Oct. 6 when another man began acting erratically and started speaking to himself, police said. Bilcik, a registered nurse who's lived in the neighborhood for nearly 20 years, said the man "turns around and starts pointing to me. And he's talking to the people at the table about how white people are the devils of the world." The man pointed at Bilcik, who is white, as he spoke, and allegedly kept telling him, "You're a white boy, you're not a man." When Bilcik went to leave the shop, he tried to duck around the suspect, who was waiting by the door with his elbow propped up against it. The man smacked Bilcik in the face, prompting Bilcik to throw coffee right back at him. The other man automatically punched him. "In a split-second, he did a Mike Tyson punch to my face, right to my eye socket and to my nose," he said. Video captured the punch and aftermath. Bilcik said he got very dizzy, and had severe double vision, with blood gushing from the eye. He staggered to the counter for help, and the suspect walked out. Bilcik said no one, not even the workers, helped as he stumbled through the shop and into the kitchen clutching at his bloody face and begging someone to call 911. Bilcik has had one retinal surgery and is scheduled to get another one for his broken socket. The suspect is still on the loose, but Bilcik said he's not letting the unprovoked attack stop him from living his life. "I'm not going to live in fear, I'm going to be aware of my surroundings," he said.